June 2, 2012: Here we present the spending and revenue records of our current president, Barack Obama, and his recent predecessors George Bush and Bill Clinton. The data is available from the Office of Management and Budget here. In case that URL changes in the future, we have preserved a copy here: hist01z3. The charts and data below use “constant 2005 dollars.” According to the OMB, the data has been normalized so it can be compared across years. To the extent feasible, the data have been adjusted to provide consistency with the 2013 Budget and to provide comparability over time. 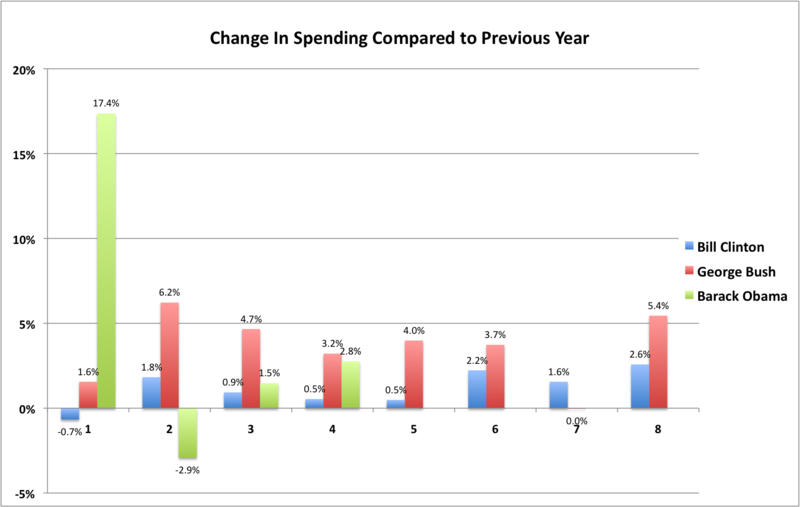 Total change in spending is arranged by year of each administration. The first year of change is presented in column 1. Column 1 represents 1993 for Clinton, 2001 for Bush, and 2009 for Obama. The green bar in column 1 represents the change from from 2008 to 2009. 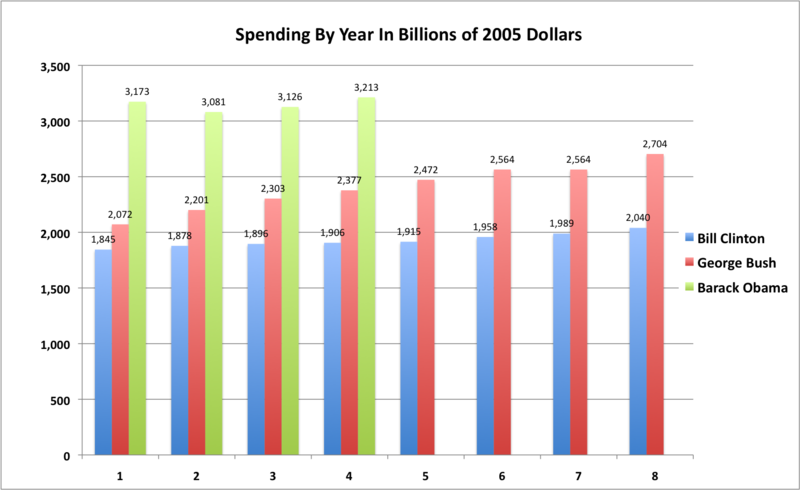 Because of the substantial increase in 2009 due to stimulus spending initiated by President Bush and continued by President Obama, there is significant debate regarding which president that year’s spending should be attributed to. There are liberal and conservative interpretations of that point. 3.60% for President Bush: More than double Clinton’s increases. 4.67% for President Obama: Even including the 17% jump in 2009. The OMB provides a comprehensive discussion of their data that we used in this article. See page 6 for discussion of TARP. 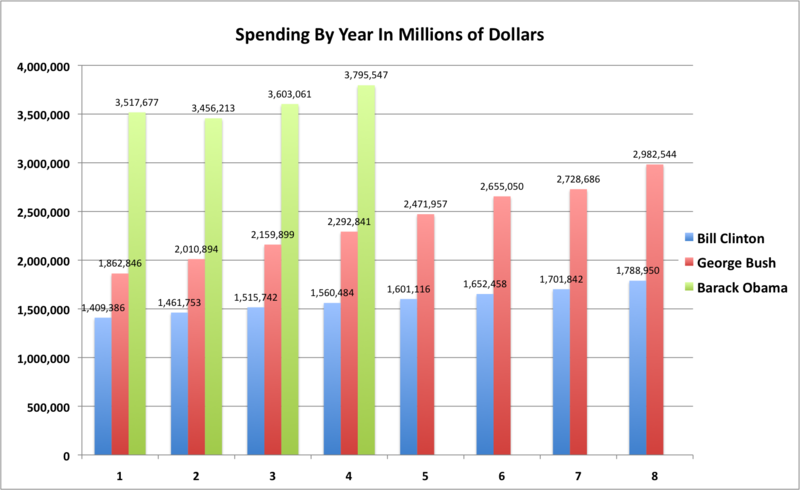 Page 54 and 55 break down the expenditures by area by year. In one row, “Commerce and Housing Credit” we see significant increases from 2007 to 2008 and 2009 (+$27B and +$290B respectively). 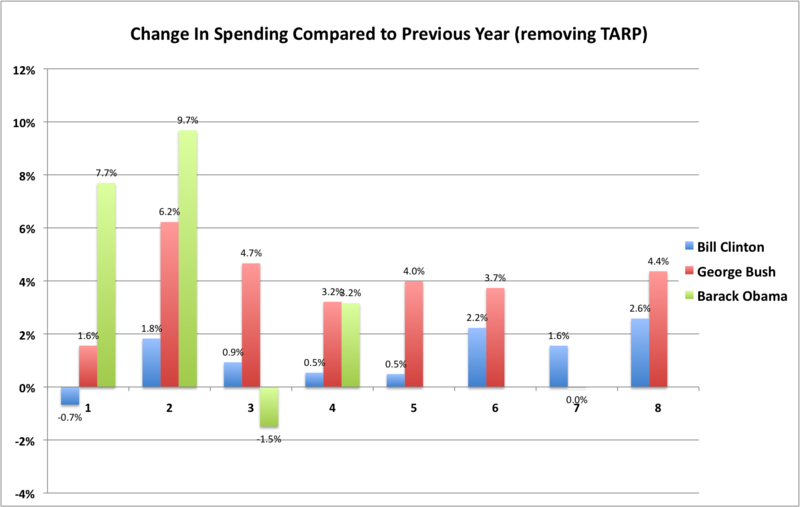 This represents increased spending to shore up housing loans starting to go bad in 2008, and TARP outlays in 2009. In 2010 and 2011 this element is negative, which reflects some TARP loan repayments. With TARP removed, the 17% jump in 2009 is transformed to a 7.7% climb in 2009 and a 9.7% climb in 2010. 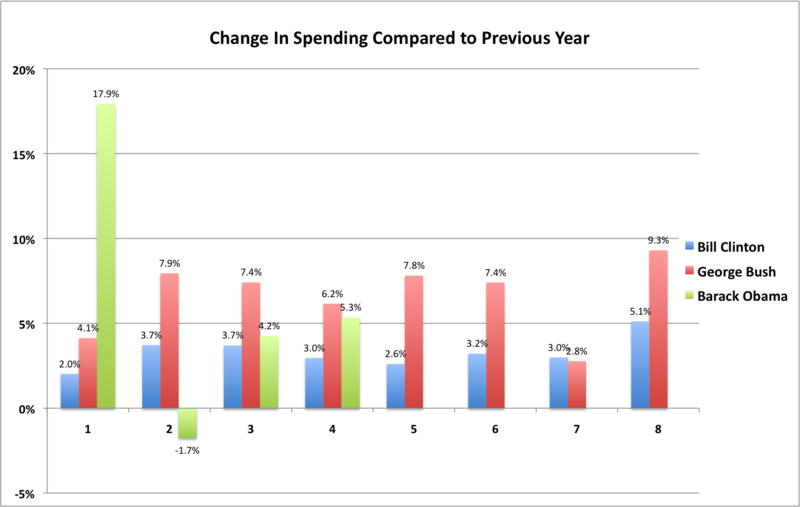 The cumulative impact of this revision is that we arrive in 2010 with spending 18% higher than in 2008 (vs 14% without that adjustment). 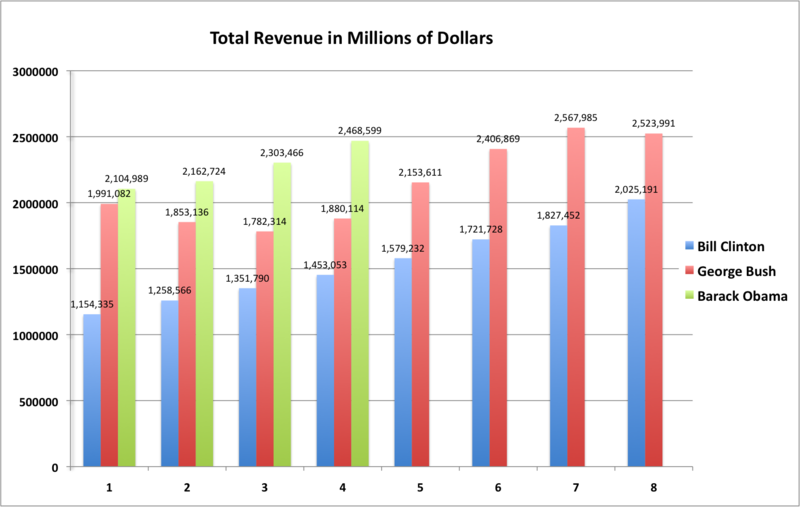 Total revenue is arranged by year of each administration. The first year of revenue is presented in column 1. Column 1 represents 1993 for Clinton, 2001 for Bush, and 2009 for Obama. 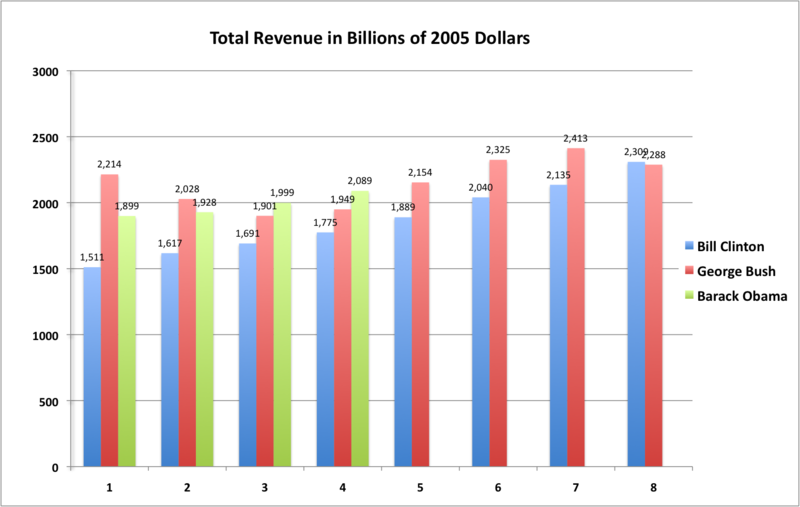 Revenue reached an all time high in 2007 under George Bush. There was an 18% drop in revenue in 2009 due to the economic slowdown in that year. As of 2012, revenues are recovering and are 13% below the all time high. 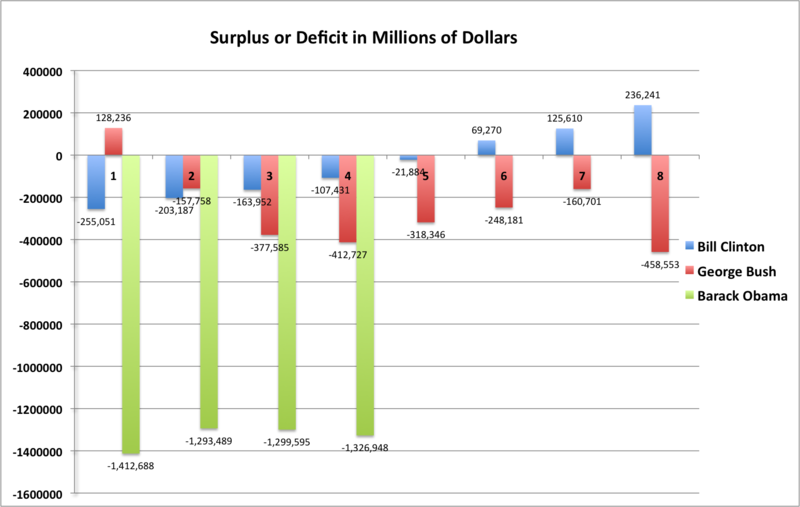 According to the OMB, total deficit spending prior to President Obama, from 1940 to 2008 is $9,839B. I revised the article above to use OMB’s “constant 2005 dollars” which include adjustments for inflation. 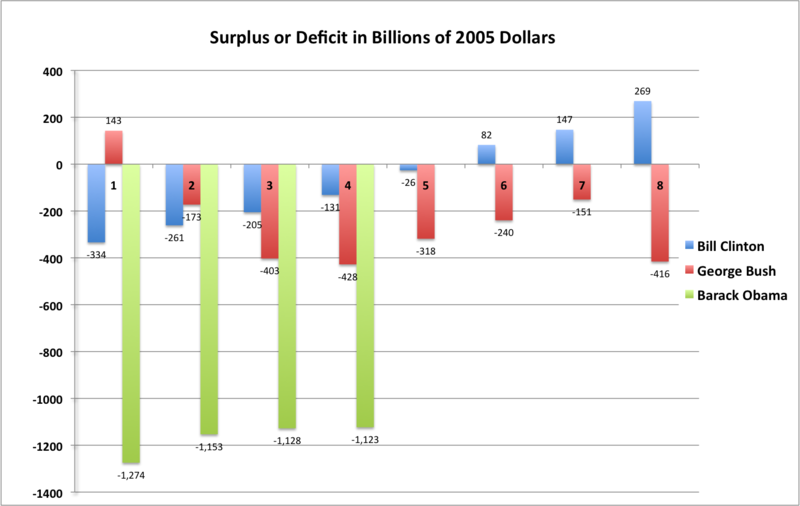 For completeness, here are the older charts computed from “current” dollars. We sought to provide an unbiased article, but must disclose that the author, Tucker Balch, is a registered Republican. Why didn’t you include George W Bush??? In the charts above George Bush == George W Bush. Other than that, how did Obama do? They are GWB. Why would they go Clinton, then back to Bush 41, then forward to Obama? They also quote it as 2005 dollar values, when Clinton was in office so it is apples to apples. Not 1990’s dollars under the first Bush. Try reading the story and learn comprehension. It goes Clinton, Bush 43, Obama just like the chart. Measuring the revenue in constant 2005 dollars shows the actual revenue in equal terms with other years, the Bush tax cuts were designed to grow the economy and thus the tax base in absolute terms, The popular measure of comparing revenue or spending to GDP removes the vital factor of economic growth from the equation. (GDP equals the economy, basically).. Clinton’s advantage here was the steadily declining spending during his administration, a decline powered by slower spending growth than economic growth. Obama revenue has exceeded Clinton revenue in each of the first 4 years of their admin, despite the tax cuts. Another measure is revenue or spending as measured in constant dollars per person. That allows for population growth as well as inflation. I stopped reading at TARP. Anybody who voted for TARP without the US taxpayer acquiring the proportional number of shares to the size of the bailout is, I hope, on retainer at a big bank. I just can’t get over that part. Most of TARP has been repaid, I’m not sure if the revenue has been recaptured in these numbers. As for the reason for TARP and the other money machinations of the Fed, we were faced with a systemic bank run that could have wiped out so much US capital that the Chinese and Japanese could have wound up buying lots of our assets for a song, especially real estate. The Fed was supplying liquidity to reduce the selling of undervalued assets into a cratering market panic. I recommend reading http://www.edwardconard.com/ for a different insight into the financial crisis and economics. I can’t wait for you to update this. Every two term Democrat since truman has balanced the federal budget- and the deficit is already half what it was in 2009. Here’s a chart that tells far more. I do look forward to updating it. Congress passes the revenue and spending bills, the President can only suggest, persuade and sign or veto. Much of the spending could be better handled by the states where it applies and most states are required to balance their budgets. State taxpayers are not fooled with the lure of getting other people’s money when it is their taxes that are paying for it. Most all taxpayers reside in states, why not let those states decide how it is spent? At the risk of expanding to the “end of the internet” you could generalize on the category and type of spending involved. Republicans tend to feel that Dems tend to reduce military spending that needs to be rebuilt. Reagan’s military is credited by some with overcoming the Soviets economically, as did Carter’s aid to the Afghans during the Soviet invasion.On the other hand, the Dems tend toward social programs that may be better served with more jobs, better, more appropriate education, more simple yet effective regulation, lower taxes, and less demonizing of businessmen.